Your website, its content and features therein are the gateway for engagement with potential customers, current clients, strategic partners and investors. Fresh and compelling content is a key aspect that helps you deliver appropriate messaging and educational information to visitors. The content should be relevant and rich in information with thought leadership and should always be written for the specific audience with an end goal in mind - engagement and useful interactions. 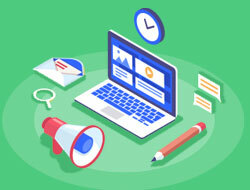 Irrespective of domain, your content and website should drive powerful and persuasive communications via a well thought out content management strategy. Content management strategy encompasses the approach to plan, create, manage, deliver and promote content. The strategy includes a planning phase where an assessment of the business and functional requirements of the industry is completed, followed by researching the types of content and messaging that would be compelling for each industry’s needs and business goals. The strategy is then transformed into reality via creative messaging and content for a new website, content refresh or application. With the help of an effective content management strategy, compelling next-gen content delivers a highly engaging and rich user experience. What is a Content Management System (CMS) and why do we need one? Digital Transformation: A content strategy targets the organization’s audience through quality and engaging content to drive deeper audience interactions. A CMS system makes the job of managing this behemoth task possible. A solid CMS enables an organization to create content, optimize it and manage it over the long term. For example, when undertaking digital transformation initiatives for enhanced customer experiences, having the underlying architecture to enable better targeting with greater flexibility is at the top of requirement lists, which a power packed CMS can deliver. Mobile-first: With more than 50% of global web traffic generated through mobile phones1, adaptive and responsive web design is extremely important. A CMS supporting mobile-first website design and accelerated mobile pages (AMP) can provide visitors an integrated mobile and desktop experience to help improve conversions. It gives designers the flexibility to design sites that offer same user experience across devices. Frequent updates to website content: Here lies the essence of an internet marketing strategy. A quality CMS gives the opportunity to elevate an average website to first-class. A quality CMS enables frequent updates to be made easily and quickly - saving both time and money. It is important to keep up to speed on the newest tech trends and advancements to keep the website running smoothly, optimized for SEO and engaging to your audience. Refreshing the website: A CMS serves as the backbone or underlying architecture of the website. With this in place, the website can be refreshed without an entire revamp. The overall look and feel of the website can be refreshed with a design or template makeover without disturbing the underlying platform. Extensibility and Collaboration: The CMS should have capabilities to integrate with the latest web technologies, ERP systems, Social Networks, Mobile app development platforms, etc. The availability of pre-developed connectors for common platforms helps in reducing development costs. Strong Security Management: Customizable authentication, module permissions, user authority and alerts should present to handle large volumes of content across business units or divisions. Support for Responsive Devices: The CMS of choice should have features to manage responsive web applications that run on various devices and platforms. This keeps your website(s) mobile friendly and responsive. Feasible Administration: CMS must have extensive features to monitor and supervise the full continuum of tasks related to both content management and website management. It should provide features including notifications, ability to add plug-ins and modules for additional functionality, and provide tracking of scheduled content publishing, etc. 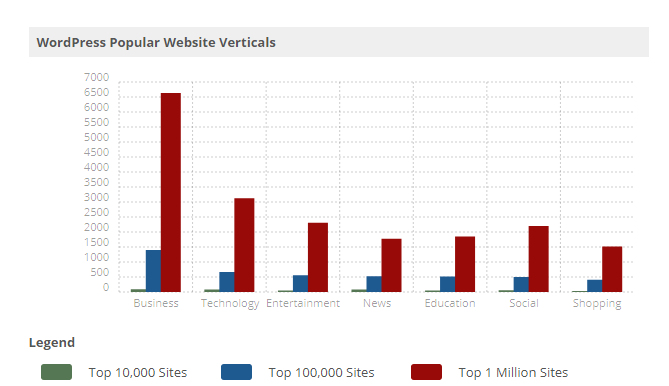 The below chart maps WordPress usage by different industries, showing the amount of websites within the 10K, 100K, and 1 million sites groups that are categorized as being in the specific vertical. Easy and Feasible: WordPress does not require any HTML or PHP knowledge. With a 1- click installation process, it takes around 5 minutes to get up and running. Open Source: It is an open-source CMS which gives the author full ownership. It provides the flexibility to change or improvise both content and design as required by the user. SEO integration: CMS offers best-of-breed SEO practices via plugins to optimize their content and run keyword analytics. Customizable: WordPress offers varying graphics templates to add a customized touch to the design. It is highly flexible with the help of different plugins and massive libraries of available themes. Intuitive User Interface: WordPress offers an intuitive and clean user interface for website management. Templates & Plugins: Since WordPress is the world’s standard, it now boasts an expansive library of thousands of templates and powerful plugins to expand functionality. Many of these are free. Malicious Software: This is malware that gains illegal access to websites to collect sensitive data. The common WordPress malware infections are backdoors, drive-by downloads, pharma hacks and malicious redirects. Brute Force Attempts: This is trial and error hacking to attack the website. In this process, multiple usernames and password combinations are used multiple times, as WordPress does not have a restriction for limited login attempts. This process overloads the server and results in slow downs. SQL Injections: WordPress websites utilize a MySQL database to operate, and SQL injections can be carried out through unauthorized accesses of the database to insert malware and corrupt the whole site. URL Hacking: As mentioned above, WordPress is a database-backed platform that executes server-side scripts in PHP. This makes WordPress open to threats such as malicious URL insertion attacks. Admin User Account: Many WordPress installs fail to change their administrator user account from the default username “admin”. This gives hackers the opportunity to exploit this account by trying different password combinations to gain unauthorized entry. A strategic content strategy drives education, brand recognition, and better targeting for increased visitor traffic and engagement with consumers. A strong CMS helps make this endeavor possible. WordPress provides an easy to use interface to leverage organizational branding to provide a powerful customer experience. As always, when reviewing technology platforms, proper strategies should be put in place to reduce risk of vulnerability. Emtec offers a suite of responsive web development services including UI design, modernization, migration to upgraded architecture and CMS platforms, etc. Contact us today, for your website needs.